Not too long ago, I was wrong about debating. Perhaps because my views were blinkered by the heavily televised debates between American Presidential candidates or by watching my own debating heroes when I was younger, I always believed that debating was about the individual. A grandstanding, intellectual fencing match between six speakers who were divided into two teams for argument’s sake. To the casual observer, debates are often decided by one person – typically the one who sounds the most stylish, makes the sharpest rebuttals, and pummels the opposing team into submission. What we slowly realize as we mature, however, is that therein lies the massive contradiction of competitive schools debating – that even though we are completely alone and isolated when making our speeches, relying on nothing more than our trusty palm cards and overworked brains, these moments of individual brilliance belie hours of teamwork and strategizing. After all, there would be no match-winning reply speech without the match already won. A rebuttal speech would probably lose most of its lustre if it were delivered in the absence of any argumentative logic. Quite tellingly, the ‘Best Speaker’ title that is handed out after each debate is a uniquely Singaporean invention. On the international stage, all the judges really care about is which side took the debate. Maybe fencing, where fencers locked in singular combat grind out points for their team, isn’t the best sporting analogy for schools debating. Think more along the lines of a relay race, which requires near-perfect execution from every runner just to be completed. It doesn’t matter if you happen to have Usain Bolt on your team – a small slip, a fumble, a botched baton passing will have repercussive effects on your race. 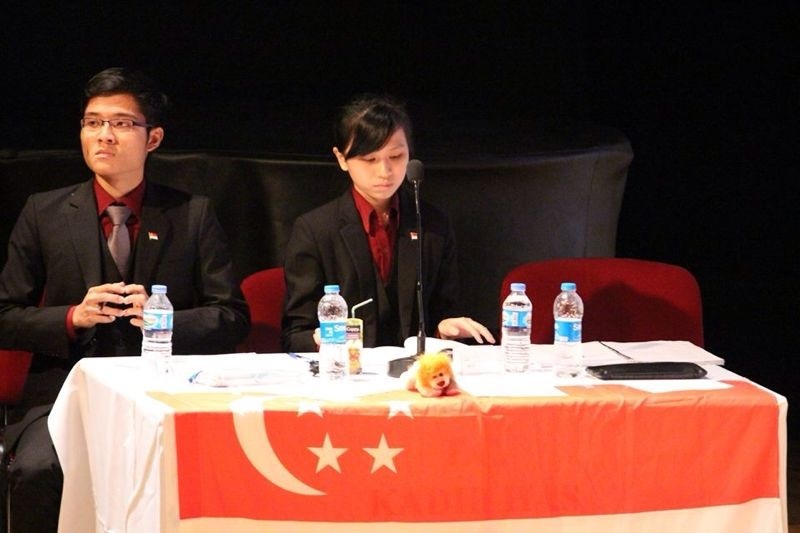 This is important, because just last month, five student debaters travelled to Istanbul to take part in the Eurasian Schools Debating Championships under the banner of Team Singapore. Four of us were guys from RI, all products of the Raffles Debaters, and each one of us the embodiment of the stereotypical Rafflesian debater (my first speaker, of course, would beg to differ). 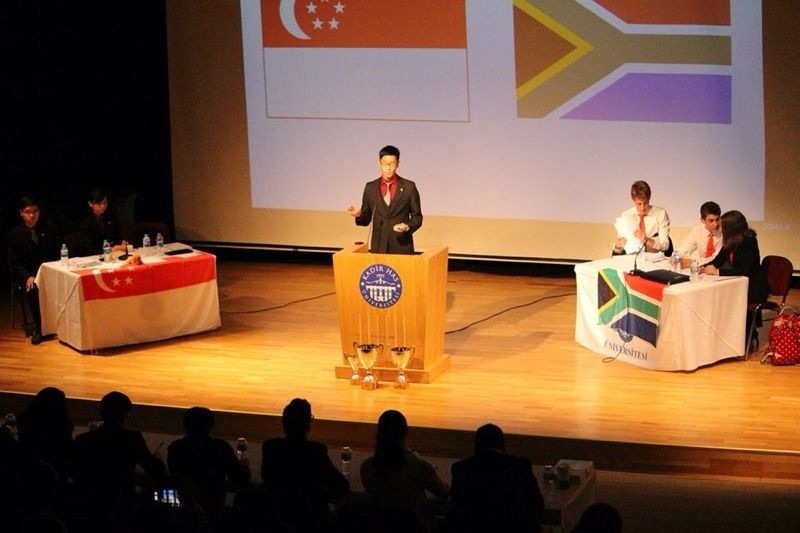 Our national captain, on the other hand, was a girl from Hwa Chong – someone who, for as long as I could remember, had been sitting opposite me on the debating floor, bent on refuting every single word and punctuation mark that came out of my mouth. What we often forget, in the midst of waving our school flags, while belting out our school anthems, or when brandishing our school colours, is that these tribalistic divides are completely constructed. It’s easy to rationalize and dismiss this, but remember – when you’ve conditioned yourself to believe that other teams are mere dissenting voices to the moral truths which you speak, when we elevate Raffles to the pedestal of deserving winners, it’s not as easy as that. And when it comes to competitive debating, where absolute trust in your teammates is literally a pre-requisite to success, every little bit counts. There is little doubt in my mind that such an attitude should transcend the parochial boundaries of schoolyard rivalries – there is absolutely no reason why we should put down other institutions or countries for the sake of our own benefit. But it was in the context of an international debating tournament, where we competed under our nation’s flag, where this probably resonated the strongest within me. Standing up to top teams from countries like South Africa, Turkey and Hong Kong required more than individual showmanship – it demanded hours of preparatory research, mechanical efficiency during impromptu preparations, and an almost irrational belief that your teammate would deliver what you just instructed him to say. Even though we snatched all 3 of the top speaker prizes and ended up champions of the tournament (winning 8-1 against a South African team), our work is far from complete. Later this year, another group of five Singaporean debaters will travel to Thailand to compete in the World Schools Debating Championships. Here’s to hoping that we run a good race.